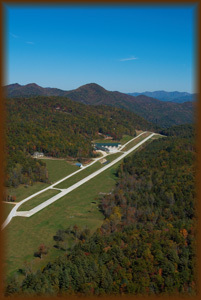 Heaven’s Landing is a mountain estate airpark like no place on earth. Whether you fly a home built aircraft or a corporate jet, Heaven’s Landing offers what a private flying family wants at a very affordable price. The weather is gorgeous, the scenery is unbelievable, and the location is perfect. As a full time residence or a second home, you’ll be hard pressed to find a finer place to live. If you have ever considered living in a fly-in community, and desire the convenience of a 5,200 foot paved concrete runway at your doorstep, complemented by beautiful scenery, great weather, and just about every amenity that one can think of, then we have the perfect place for you! When you live at Heaven’s Landing you have no reason or need to be anywhere else, yet you always have the flexibility to conveniently go anywhere that you want to be. Heaven’s Landing is a waypoint to the world, but more importantly Heaven’s Landing is the perfect destination. Heaven’s Landing was featured on “The Aviators” which aired internationally on The Discovery Channel. Click: https://www.youtube.com/watch?v=cNsHGpACHu8 to watch it now, or go to www.heavenslanding.com to view several additional videos that feature Heaven’s Landing and the fly-in lifestyle. Contact: (706) 212-0017 or 1-800-HEAVEN-2 for more information.